Michael Phelps poses for Louis Vuitton's new luggage campaign. Photo courtesy of Louis Vuitton. Has your Michael Phelps hangover left you with a pounding headache? Try a little hair of the dog. 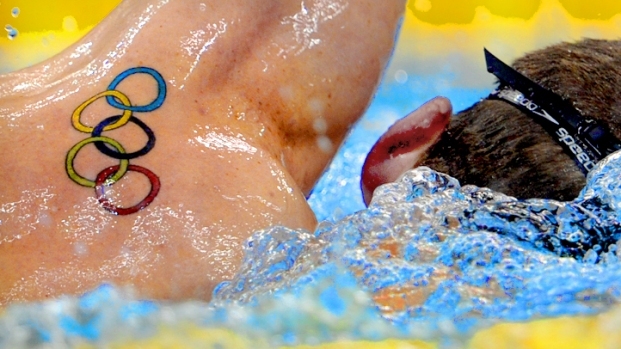 Just hours after the closing ceremonies for the 2012 Olympics, A photo of Phelps lounging in a bathtub in Speedo, open Louis Vuitton bag at his side, made its way to the Internet via Just Jared. With a pair of swim goggles perched atop his forehead, the look on Phelps' face is somewhere between "come hither" and "get out"--maybe a bit of both. On the floor next to the tub a pair of jeans and towels sits a top the luxury bag. The image appears to be an ad for Vuitton, which is featuring Phelps as the latest celebrity in its Core Values campaign, according to the Daily Mail. In that ad, he sits clothed in a three-piece suit on a couch with 77-year-old former Soviet gymnast Larisa Latynina. But the fashion giant was mum on details on the bathtub photo. None-the-less fashion blogs around the nation pronounced it divine. If the two images don't give you your fill of Phelps, stay tuned for the start of season five of "The Haney Project," during which Phelps will travel the globe with acclaimed golf coach Hank Haney, playing the best courses in the world. No world on a Ryan Lochte reality show.